We offer ourselves and all creation to the Lord at every Divine Liturgy with the words, “Offering to Thee Thine own of Thine own, on behalf of all and for all.” We acknowledge that everything we offer to God is a gift from Him. We take what God has given to us and we return it to Him as an act of our thanksgiving and praise. As stewards of God’s gifts, we return to Him a portion of our time, talents and treasures for Christ’s work on earth through His Church. The Christian Stewardship Program is an opportunity to respond to Christ’s love by perpetuating His ministry through the Church. Stewardship places the responsibility to support the Church exactly where it belongs, on us. A Steward, according to the Bible, is one who manages and uses the gifts entrusted to him by God for his personal welfare and for the perpetuation of the Lord’s work. Our money and possessions are not ours, but on loan. When we give to the Church, we return to God, the Owner, His rightful portion. The more we are given, the more is expected of us. Money is a necessary tool for ministry. To fulfill the Church’s mission, we are called upon to commit ourselves to bear our fair share in the financial support of our Church’s expenses on a parish and Diocesan level. WHAT GUIDE CAN I USE TO DETERMINE MY GIVING? Proportionate giving involves two things. Firstly, that our level of giving rises out of our level of income. Secondly, that giving out of thanks will involve sharing a portion of that income for God’s work. We should ask ourselves “what is a worthy level to determine my Stewardship?” The Bible gives much guidance by teaching us that direct giving to God and His work should be proportionate to our income, wealth and possessions. Each person is to give according to his or her own ability. The Old Testament laid down the standard of the tithe or 10% of one’s income. This provides us with the principle that giving should be a proportion of our income. Each Steward should determine what percentage of his or her income will be committed to Christ and the Church. We should consider what we spend on television, holidays, pets, dining out, sports events, vacations and so on. How do these compare with our giving for God’s work? AM I BOUND TO MY STEWARDSHIP COMMITMENT? Your Stewardship Commitment is kept in confidence. Jesus taught us that giving should be done quietly, generously and out of sight of others. If you wish to revise your commitment during the year for any reason, you may send a note to the Church Office indicating your intention. HOW SHALL I PAY MY STEWARDSHIP COMMITMENT? You may pay your commitment in the manner that suits you best. Since small regular contributions are easier to manage, it is suggested that your contribution be made on a weekly or monthly basis. You may however also contribute, quarterly, semiannually or annually. WHO WILL MY STEWARDSHIP COMMITMENT INCLUDE? The Stewardship Commitment includes husband and wife for married couples and single adults as Stewards. Family members over 18 years of age, who are employed, should make their own Stewardship Commitment. HOW WILL MY STEWARDSHIP CARD BE COLLECTED? The Stewardship Commitment Cards can be submitted on any Sunday at church or they can be mailed to or dropped off at the Church Office. HOW CAN A NEW STEWARD JOIN OUR CHURCH? 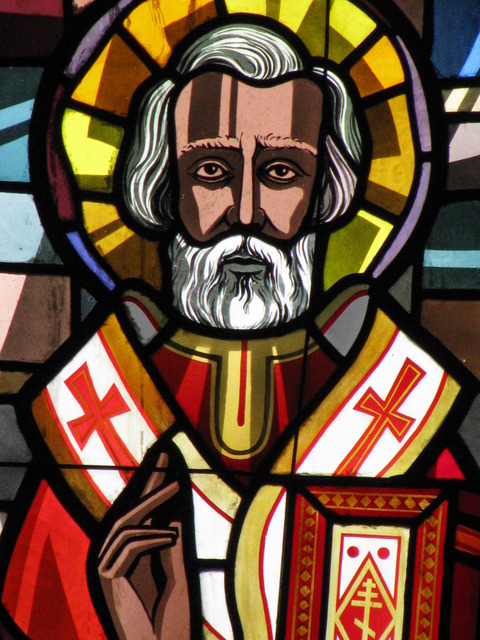 Orthodox Christians, who wish to be served by our parish, may become Stewards of Saint Nicholas Orthodox Church by making a Stewardship Commitment for the current year.